Choose from yoga, pilates and meditation classes to stay fit in 2018 at Skyspace LA. Stick with your new year’s resolutions by joining one of the many health and wellness special events at OUE Skyspace LA. Special events range from yoga and pilates to meditation classes. 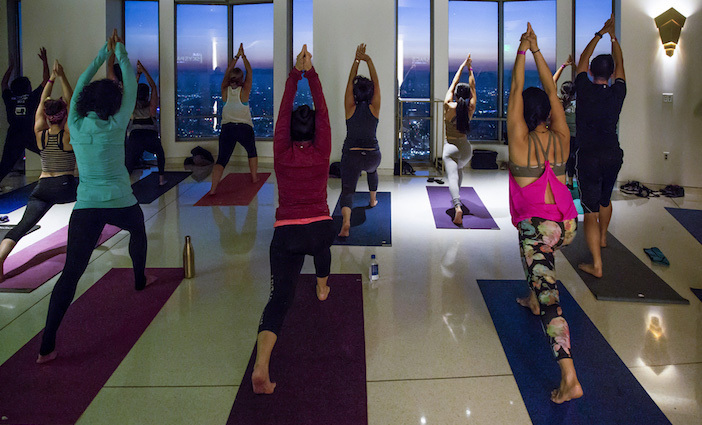 Get your yoga pose on at 1,000 feet in the sky while taking in the city from a bird’s eye view; Skyspace LA is among the tallest buildings in the West and home to the most spectacular views in LA. From the Hollywood Sign to the Pacific Ocean, you’ll see the entirety of the city perched high on a platform in downtown LA. No matter what class you choose, your ticket allows access to all four levels of Skyspace LA which includes new interactive media, a snack bar, two outdoor observation decks and the world’s only all-glass Skyslide. Feel the heart-pounding thrill as you slide down from the 70th to the 69th floor on the outside of the building after your class. Don’t miss your chance to workout surrounded by inspiring 360 degree views of LA. Upcoming classes include yoga with Evoke Yoga, yoga fusion with Create Yoga, pilates with Equinox and a guided meditation class with The Den Meditation. Ticket prices start at $25. These sell out quickly so check the website for the most up-to-date available classes. 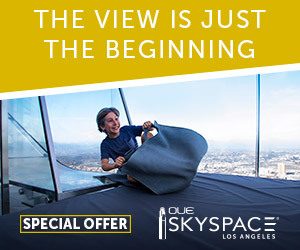 OUE Skyspace LA, 633 West Fifth St. #840, downtown, 213.894.9000. Learn more about tickets.